A disaster in the making, frozen in time. A logging raft with seven men aboard rounds a sharp turn in the Susquehanna River in central Pennsylvania sometime around the 1840s. As the men tug desperately at the oars, the raft smashes into a large rock in the center of the river and breaks apart. The men jump for their lives and cling to the raft to avoid being swept downriver by the swift current. This scene (above), painted by Linton Park about 1874, spent many years as wall decoration in a loggers’ hotel in Burnside, Pennsylvania, near the scene of the accident. Its presence there must have been a searing reminder of the hazards of this way of life. The artist knew logging, to be sure, but research into his life has revealed that he was a most unusual character with a wide range of enterprises. Linton Park was born in 1826, the last of nine children of Scotch-Irish immigrants who settled Indiana County, Pennsylvania. Family tradition holds that from his earliest days, Park was a confirmed vegetarian, once even scolding the family dog for gnawing a bone. 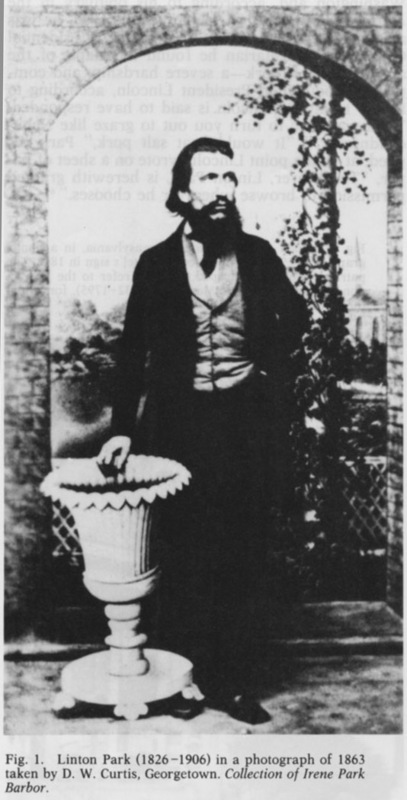 He worked as a logger, carpenter and painter in a number of nearby towns, and ended up in Washington, DC in 1863, working on the crew that painted the new dome of the Capitol Building. A photo of him at this time appears above. It wasn’t long before Park had his brush with greatness. In 1864 he joined the Union Army, and served in the DC Infantry assigned to the Presidential Guard. According to a story written in 1905 by his nephew, Park complained directly to President Lincoln about being served salt pork. According to this account, Lincoln replied, “You want me to turn you out to graze like Nebuchadezzar?” To which Park replied, “It would beat salt pork.” Lincoln then wrote out on a sheet of paper, “The bearer, Linton Park, is herewith granted permission to browse wherever he chooses.” If only this paper survived, vegetarians everywhere could have used this Presidential Proclamation to have their food preferences accommodated a century before it was fashionable to do so. Later in life Park became an inventor, and received patents for a Venetian-type window blind, a “Cottage Window Shade,” and, more in keeping with his dietary preferences, a device for peeling vegetables that he called the “Vegetarian.” He also painted, not just scenes but also wagons, furniture, and signs. His most famous painting is a rollicking, Breugelesque scene of a flax scotching bee, in the National Gallery of Art (above). 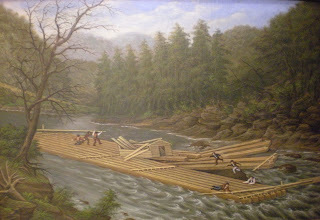 The logging pictures, which include the Fenimore Art Museum scene of the rafting accident, stemmed from his early days when he crewed on log rafts and even helped build them.In our scene, among the men tugging at rudders or jumping to avoid certain death, there is one figure at the far right in shirtsleeves who clings to the side of the raft for dear life. Family tradition holds that this is Park himself. One hardly wonders why this creative vegetarian gave up rafting logs in favor of painting them.